During a speech at the Iowa GOP's annual Lincoln Dinner, Sen. Rand Paul challenged possible 2016 Democratic candidate Hillary Clinton on her record as secretary of state during the deadly Sept. 11, 2012 attack on the U.S. consulate in Benghazi, Libya, saying it showed a "dereliction of duty and should preclude her from holding higher office." CEDAR RAPIDS, Iowa — Presidential elections start in Iowa. On Friday, Sen. Rand Paul put his stake in the ground for a possible run in 2016 by mocking the Obama administration and delivering a blistering critique of former Secretary of State Hillary Clinton's handling of the terrorist attack in Benghazi, Libya, that killed four Americans, including Ambassador Chris Stevens. The administration has been criticized for failing to provide security during the attack and for its characterization of the incident afterward. Speaking at the Iowa GOP’s annual Lincoln Dinner, Paul questioned the initial response to the attacks and asked, "First question to Hillary Clinton: Where in the hell were the Marines?" Sen. Rand Paul, R-Ky., has his photo taken with Linda Stikle of Anamosa, Iowa, after he spoke at the Iowa GOP Lincoln Dinner on Friday in Cedar Rapids, Iowa. "It was inexcusable, it was a dereliction of duty, and it should preclude her from holding higher office," the Kentucky Republican added to loud applause. Republicans' search for a candidate to deliver their first victory in a presidential election since 2004 began as Paul used the plum speaking slot to plant the seeds for his own possible bid. And he won his biggest applause by taking on Clinton, who's seen as the early front-runner for the Democratic nomination to succeed President Barack Obama. 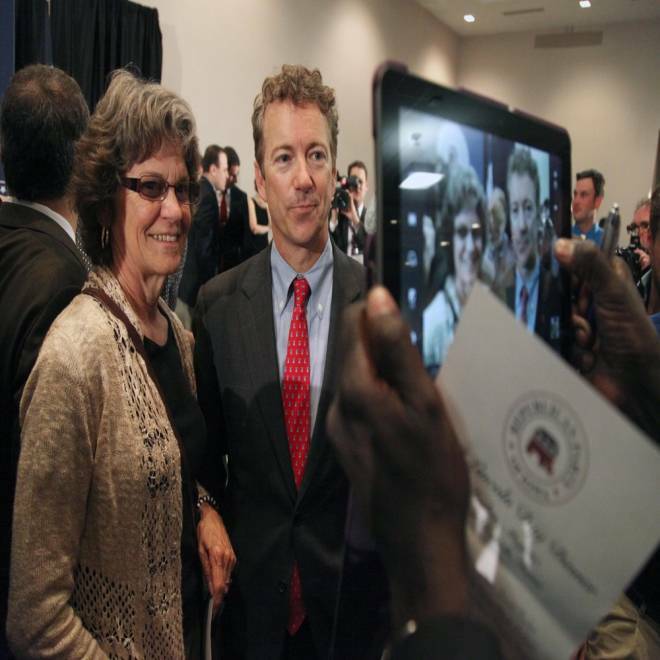 Paul was just elected to the Senate in 2010 and is perhaps best known as the son of the former Texas Congressman Ron Paul, whose two campaigns for president attracted a fervent, grassroots following that might translate to his son. But the Kentucky senator has been far from shy about stoking speculation about his own play for the Republican nomination in 2016. He told reporters earlier Friday that he had not made up his mind and would not decide until 2014. The fundraiser on Friday had unmistakable overtones of a presidential campaign, though the last one ended just six months ago. Rep. Steve King, R-Iowa, captured that sentiment best in his speech preceding Paul's: "The process of selecting the next leader of the free world begins in Iowa, and it's already begun." Paul's speech doubled at times as a comedy scene, as he seemed at ease before the crowd, stepping away from the podium, microphone in hand, to project a casual demeanor. He rattled off jokes about absurd pork-barrel projects, recalling the campaign style of Arizona Sen. John McCain as he ran for president in 2008. But Paul also used his closely watched speech to offer his own prescriptions about the path forward for the Republican Party, which has been suffering from somewhat of an identity crisis since Mitt Romney lost to Obama in last fall's election. On no issue is that crisis more clear than immigration. A bipartisan bill has advanced in the Senate to allow undocumented immigrants a pathway to citizenship, but King and Sen. Charles Grassley, R-Iowa, both railed against the proposal in their speeches before Paul's. Paul has spoken in favor of some kind of immigration reform, a dicey topic before this Republican crowd, and he acknowledged those disagreements. But he also tried to align himself with King and Grassley — two of the most stalwart opponents of immigration reform. "I'm also with Sen. Grassley and Congressman King on the fact that I think we were hoodwinked in 1968," he said, referencing the last time Congress passed a major immigration overhaul. "We were promised security, and it never came." But Paul also said there's a "chance [he] could vote for the bill" if he can add amendments strengthening its border security measures. Paul also spoke about broadening the party's appeal, namely to Latinos, African Americans and young voters. "We're an increasingly diverse nation, and I think we do need to reach out to other people that aren't like us, don't look like us, don't wear the same clothes, that aren't exactly who we are," he said. "We're going to have to do something."